Looking west on Walker Street. Looking west on Mill Street. A very typical home in town. Orland is known for its wide neighborhood streets. Another humble home in one of Orland's charming neighborhoods. A front-yard shrine to Our Lady of Guadalupe just a little southeast of town. Many homes in the Orland area display expressions of a devout Christian faith. Orland's neighborhood alleys show some age but are usually clean. Looking north from the corner of 5th and Colusa Streets. Orland's Carnegie Center in Library Park. The City Council meets here. The Orland Library through Orland's historic arch. Statues of Catholic saints through the window of a downtown shop. Downtown Orland - looking south on 4th Street across Walker. The Kountry Kitchen has been Orland's main gathering spot for many years. One of my favorite houses in Orland, one block from St. Dominic's. I liked the pictures. Thank you for posting them. Bit of trivia ... there was a nasty twister that came through there (I think it may have been an F3, at least an F2) some years ago. Thank you for the comments, gentlemen. If I remember correctly, that tornado passed just outside of the city rather than through it. Tornadoes are rare but they do happen. 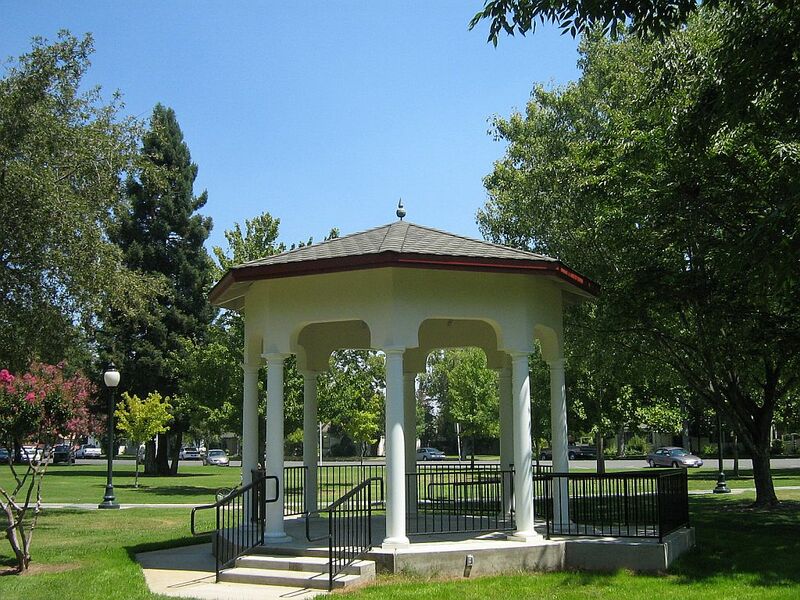 Here's a photo of Orland's new gazebo in Library Park, just completed last year. Also - the city is celebrating 100 years of incorporation this year. There are lots of festivities planned, so if you have a connection to Orland you might want to check the centennial website regularly. 1. The historic Booth Hotel on 5th and Walker is finally being restored. The project looks great so far. 2. The Sapphire Plaza shopping center is nearing completion. 3. The Hwy 32 entrance to Orland is being landscaped beautifully. A new sign reads "Welcome to Orland: Proud History, Bright Future". A nice trip through a city I've only stopped in to get gas. It looks like a set from Back to the Future. Too bad the Central Valley is so freakishly, unhumanly hot in the summer. How places like this survived in the days before A/C I never could fathom. Well, yes, it does get hot in the summer. Last year I lost around 20 chickens due to the heat. But the other three seasons are very pleasant. It was so great to see this pictures, Orland is my hometown, It´s been about 16 months since my last visit, I moved to Morelia (mexico, I have a great job down here). I have great memories from my childhood, it was nice growing up in a small town. Here's the recently restored Booth Hotel. "The history of the beautifully carved oak bar in Farwood is well known to area residents. It was made in England, shipped around Cape Horn at the south end of South America, and functioned as a bar in San Francisco for an unknown number of years. In 1916, it was barged up the Sacramento River to be installed in the Richelieu and has remained there ever since. In 2005, when Bob & Jan Walker purchased the building, the business, which did not remain a gentlemen's bar, was closed. Their decision to purchase the property was based primarily on the existence of the bar. At that time, it was coal black (from over a hundred years of cigarette smoke), and was in need of repair. When renovations began on the building, the bar was taken apart as much as possible and transferred to a shop on the Walkers' farm. It spent the winter there being stripped and sanded, and then lovingly repaired by a local wood craftsman, Bob Nordbye. He also extended the front bar portion and crafted a handicapped bar to exactly match the beautiful bowed front of the original. He made molds of the cherubs' heads to repair the one cherub who had been decapitated, and it is sometimes a matter of discussion to see if former Richelieu patrons can remember which cherub it was that needed repair. "